If you read my post yesterday you know my editing woes are gone. I came to terms with the fact that I need rewrite two-thirds of my book. So I decided I'm going to treat March like another month of NaNoWriMo. I can't say that I'll get 50,000 words becasue I'm already woefully behind, but I hope to write at least 30,000 words. Basically it's a chance for people to set any writing or reading related goal in Mach and get lots of support from fellow authors. And yes, there are prizes. Go here to learn more. 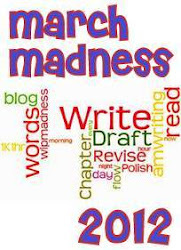 I'll be talking about this on twitter using the hashtag #wipmadness come join us, and be motivated! P. S. If you're here for the IWSG I voiced my woes about editing last week, should you want to take a look. Good luck with those re-writes! You can do it! Sounds great Jen. I don't know if I can manage this right now. Life's crazy. Have fun, I may try to do it unofficially though. Hey! Hey! I'm doing a NaNo month too! Score! March Madness sounds fun! I hate when you get to that part where you have to rewrite so much, but just remember, it will be worth it in the end. Good luck! March Madness sounds like a great idea. I might check it out. I've got a project that could probably do with a deadline. I hope your rewrites go well - I'm sure you'll find it liberating when you get into it. I'm hoping to get this one I'm working on done by the end of March. But I said the same thing about February. And January before that. I'm a slacker. No writing until I finish my book tour. Step one accomplished: You embraced what needed to happen to improve your novel. It takes a passion for your story, something I'm sure you have. March Madness sounds perfect. I wish you the best of luck as you tackle this rewrite. I'm working revisions on the first draft of my WiP. Excited to see what will come of it after I get into the hands of my betas. Wow, good for you to take incentive to move forward. March Madness huh? I gotta check this out. Hey, p.s., Imagine Dragons in concert was RAD! I keep my goals simple, do something related to writing everyday. Today it was the insecure writers support group that got my attention and is spending my time. First Wednesday of every month, remember? Never heard of this March MAdness, will have to check that out. I hadn't heard of this, but now I'm stoked for it. Goal: To finish my memoir. Maybe not have it edited, but at least have it written.